Saint Nicholas the Storm-Tossed, the Saint of the Sea, the beloved of the people and protector of seafarers, is particularly honored in Mount Athos. Celebrating him are Stavronikita Monastery, Gregoriou Monastery and many Cells. This Saint was the Archbishop of Myra in Lycia of Asia Minor, where his tomb and the remains of his old church are today. He was benevolent and charitable, a defender of truth and justice. The saints are privileged to console the faithful. The great turmoil of the world has need of the visit of the saints. The economic, spiritual and moral crisis of our days hopes for and expects help from above. 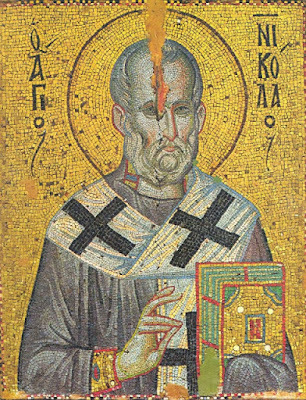 Saint Nicholas in his time was a patron of the impoverished and of his afflicted fellow men. Many are his miracles. The era was like ours. There was deprivation, poverty, need, miseries and disappointments, as well as almsgiving, consolation and spiritual stimulation. 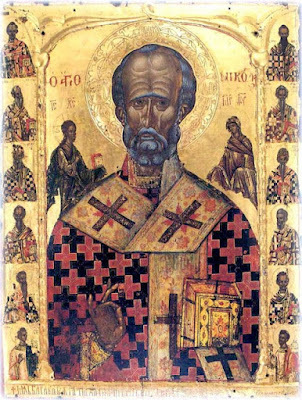 Saint Nicholas is a bright example. At a time when we can have some amenities and facilities, but also confusion and agitation, the Saint guides from above. Many people want to take God's place in our lives. Wickedness and evil finds ways to get into the depths of our soul. Saint Nicholas releases us from these traps. Some "protestantize" by underestimating the saints and others overestimate the saints while underestimating Christ. The saints, as we said before, are good and trustworthy friends, ardent intercessors, affectionate mediators. Saint Nicholas crosses seas and lands to protect and save those in need. He is a known, beloved and revered Saint. He has boldness before Christ and Christ willingly hears him. This is why he is so beloved by the people. His icons with their silver "shirts", with the many offerings and lamps, work miracles for those who embrace them with fervent faith. To all those who celebrate today, I wish you many and blessed years. May Saint Nicholas protect us all.